Advocacy organisation Women In Games has appointed a new four-strong executive board. The new board will meet monthly to manage the daily operation of the nonprofit firm. An existing advisory board will assist in organisation, meeting on a quarterly basis. 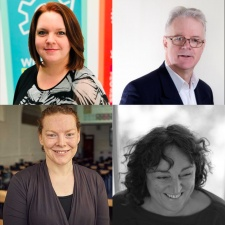 The executive board consists of Dovetail Games chief people officer Gemma Johnson Brown, Abertay University head of computing and mathematics division Professor Ruth Falconer, Women In Games founder David Smith and CEO Marie-Claire Isaaman. Women In Games is looking for two more roles to complete the executive board, seeking a marketing director and events manager. “Women in Games has been a grassroots organization relying on goodwill, ad hoc sponsorship donations and the tireless efforts of volunteers who believe in our cause and want to help,” said Women In Games CEO Marie-Claire Isaaman. “I personally want to thank everyone who has supported us and contributed so much over the years. “You can only get so far on goodwill alone. Therefore we are focused on building an organization capable of delivering deeds as well as words and the creation of the executive board and revised advisory board is one of the many steps the organisation is taking to achieve this”. 2019 marks Women In Games’ 19th anniversary and the nonprofit plans to fill the year with a number of meaningful events and initiatives to celebrate a year of activism.